I am investigating how to find ways in artistic practice for the virtual or potential to take a form in the actual? Can the virtually new take place in a performance practice, and in the “real”? This project took place in a post-industrial mining town in Silesia, Poland, including a performance, a video-performance and an exhibition and was curated by Stanisław Ruksza from CSW Kronika in Bytom. What are the conflicts and frictions that my practice meets in encountering the “real”? What is the quality of artistic practice and how does it differ from the “real”? The project is based on encounters, meetings, interviews, workshops, images, reflections, recordings, archives, and questionnaires from Bytom. How do concepts of “plasticity” or “affect” locate themselves in artistic practices concentrating on socio-political issues? The concept plasticity, ability to give form and to receive form – which in my research is related to “sponge subjectivity” – has been recently developed by Catherine Malabou. Plasticity carries the idea of giving form and receiving form. Yet, Malabou wants to evoke another aspect of plasticity: the annihilation of form. How are forms exhausted and what kind of performance or practice entail or are built on that? Bytom is a former mining town in Upper Silesia, Poland. This area is famous for mining industry, which, however, has almost disappeared during the past twenty years of economic transformation. Bytom is an exemplary of the transformation, which neo-liberal politics produces. In 2012 I was invited by the curator Stanisław Ruksza from CSW Kronika to do a project in Bytom, and thus visited this city on several occasions. 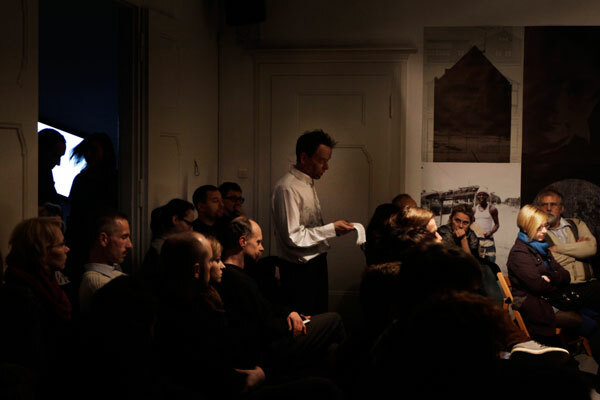 These visits were composed of workshops, interviews, field trips and other events, which produced source material for an affective interpretation of the situation. The final works presented at the Kronika from the end of November 2012 to the end of January 2013 were a scripted performance, an installation and a video piece. How does artistic practice reflect upon the destructive transformation and production of indifference? In this paper my aim is to appropriate the concept of plasticity in my artistic research. Plasticity as a concept is closely related with fine arts and theatre starting from Plato and it carries within it an idea of giving or receiving form – mould and impression. Plasticity does not signify mere elastic malleability, but definite rigidity, also. Moreover, Catherine Malabou emphasizes another aspect of plasticity, that is, annihilation of form. Such annihilation is caused by a psychological or physical trauma – an accident or disaster, which will change the subjectivity interminably. There will be a cut, which will separate the subjectivity from the past more or less entirely. The neoliberal transition and conditions produced thereafter have similar effects on the subjectivity as trauma or destructive plasticity – particularly diminishing of affectability and consecutive production of indifference. Indifference, coolness and impossibility for transference are being produced not only in relation with others – id est., the impossibility of transversality in a group – but in relation with memory and history, as well. A fundamentally new subjectivity is not a new articulation of matter reconstructed from the remains of a preceding subjectivity, but it is irreversibly and incomprehensibly new. It is an event. In this project these questions were approached with aesthetic and theoretical apparatuses, with intention to produce an aesthetic device of resilience or resistance for neoliberal engulfing of subjectivity. I was working almost a year in shorter periods in Bytom encountering people from all walks of life, paying attention to the material differences as well as my self-reflections, expectations and desires. My artistic work, a scripted performance and a twenty-minute video work, was based on these encounters, meetings, interviews, workshops, images, reflections, recordings, archives and questionnaires from Bytom. The project was not an objective socio-political articulation of the effects of neoliberal politics in Poland, but an affective interpretation, as such. It could be argued that this method is a subjective intervention. However, I would like to offer two opposing points of view. Simon O’Sullivan writes in his book On the Production of Subjectivity (2012) that the subject is a “site and locus of a kind of battle against the homogenizing powers of capitalism … but it was also a lived experience. A lived problem we might say.”(O’Sullivan 2012, 2.) The subject is the problem and the battleground of power and subjection. Power is what produces subjectivity, which is a site of potential resistance, also. When semio-capitalism produces “an alienated, atomized and homogenized individual,” as O’Sullivan argues, it is the practice and a specific bodily performance, which not only articulates this, but probes and explicitly presents how homogenization is taking place. It is the practice, which aims to articulate processes of homogenization and alienation among frustration, hope and invention. If the subject is unintermittedly exposed to visual representations of happiness, then how can a subject make a difference between the economy of joy, which requires him to excel as homo oeconomicus, and joy, which produces minute lines of flight? Both ways are productions of subjectivity, but the result is altogether different. The second point of view to the subjectivity as a node in the existing real comes from the interpretation of my performance in Bytom. Mikko Jakonen perceived it as a fold, an event, where the audience, which was mostly people from Bytom, created folding and intertwining interpretations of what they saw. This was distinguished from my own folding path in a way; no matter how we met in the event of performance, our paths were different in the length of folds. There was no direct contact, but folding. For Jakonen, and following Deleuze, a contemporary subject is a ‘cave man’, or a ‘miner’ digging his endlessly expanding tunnels, which will never lead to the outside, but produce a folded network, instead. A city like Bytom resembles Swiss cheese, instead of a solid ground. 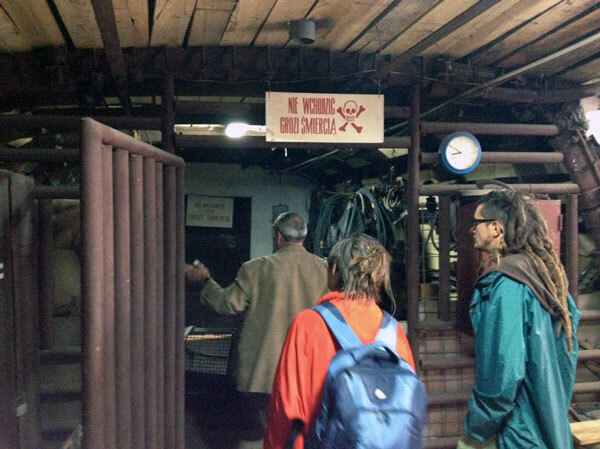 One of the workshops took place in the suburb of Bobrek, which used to be a central working class community before the transformation period starting from 1990s. Bytom was an important site for the Polish mining industry and Bobrek was a highly organized and well functioning community close to a coalmine and steel factory. When five of the seven mines in Bytom were closed, however, this area became a broken community. Most of the people lost their jobs, the culture-centre and school were closed, and no major renovations for the hundred-year-old housings have been done. At the moment Bobrek is an area of excess, with people on reserve and destitute. Domestic violence, drug abuse, alcoholism and even a toxic wasteland nearby the houses produce traumatic events. In my experience from the workshop and informal discussions with people the transformation had deteriorated their trust in the government or society as a whole. At the same time, trauma may build up resilience, as psychoanalyst Boris Cyrulnik describes the innate ability to survive a trauma by “abandoning the imprint of the past.” (Groskop 2009.) In this way a subject is able to ”knit” a protective mesh, which is not at all a denial of the past, but a necessary strategy for survival for children, young people and adults going through unfathomable difficulties. Resilience is constituent of plasticity. Lacoue-Labarthe and Nancy criticize the concept of plasticity for the specific reason of “the mimetic will-to-identity and the self-fulfilment of form” and how it was used for example in the racial typifications produced by the Nazis. It is this type, or Gestalt declared by Alfred Rosenberg which is “always plastically limited”, where “its essence is to have form” or “to limit” and detach “a figure from a background, which isolates and distinguishes a type,” writes Lacoue-Labarthe and Nancy (Lacoue-Labarthe and Nancy 1990, 306–312.) However, it is a type of subjectivity, which stands against a dark background: “a double, that inaccessible world, or to what I have no interest,” writes O’Sullivan on Bergson. (O’Sullivan 2012, 41–42.) Contrary to the Rosenberg’s Gestalt, “I” am the interruption against a “dark background”. It is this background, which meshes with the plane of potentiality and the virtual. It is the dark matter of the background, which infinitely is never being colonized by capitalism. (2)O’Sullivan writes that “it is not the virtual that is here being colonized, but simply the possible, or we might say – at a stretch – a specific set of virtualities, or even certain actual-virtual circuit.” (O’Sullivan 2012, 239). In the present context of semio-capitalism a performing subject is a “sponge-like” subjectivity. A sponge has a form, which is able to absorb affects and information. It is able to mix and use information without losing its form. A sponge is resilient, flexible and it is plastic. It is specifically a sponge made out of plastic and not an organic loofah sponge. A sponge is balanced with rigidity and suppleness — thus it is not implicitly adherent with the new, unknown, the other or difference. Sponge subjectivity is in turn supple and flexible, more inclined towards the return of the same, in other words repetition with indifference or repetition without difference. A sponge is prone for control, seeing that the function of a sponge is directly linked with the appropriate amount of wetness absorbed in the pores of a sponge. It is a subject, which self-controls itself in the way described by Deleuze in the Postscript on the societies of control (Deleuze 1992) or how Foucault analyzes the development of homo oeconomicus in neoliberal governing in his series of lectures published under the title The Birth of Biopolitics: Lectures at the Collège de France 1978–1979 (2008). An alcoholic sponge meticulously controls the right amount of intake not different from manic use of exercise. Sponge maintains right intensity with meticulous control. Sponge is prone to wetness and liquids and to keep the balance of vital fluids. (3)I want to thank professor Esa Kirkkopelto for insight on how mental processes are interpreted through the metabolic fluids and humors in antiquity and beyond. However, transformation into a sponge “type” includes a double — a shadow, mirror or echo. (4)I want to thank professor Kelina Gotman on the issue of shadow, mirror and echo. Her presentation on the philosophy of Clement Rosset at the “How Performance Thinks”-conference in London, April 2012 affected a great deal on my articulation of this subject. Transformation takes place against that dark background proposed by Bergson or Hegel. Transformation happens in discomfort, where a potentiality of annihilation is present as a discomforting presence of a shadow. A shadow is distinct from a sudden impact-causing trauma, where suffering has no duration. A type of sponge is being produced during the economical transformations, while some forms remain in partial shadows, like part of the dark background. Volatile, as it is in Bobrek. Any of a large and varied class of materials used widely in manufacturing, which are organic polymers of high molecular weight based on synthetic materials, and may be moulded, extruded, or cast when they are soft or liquid, and then set into a rigid or slightly elastic form. It is the pertinence of supple plasticity in a sponge, which is valuable for creative processes, social, mental and political aspects of subjectivity. However, potential suppleness is not infinite in actuality but virtual. The plastic subjectivity of a sponge is not infinitely employable, but limited by the dark background and prone to repetition with indifference. In my argument, it is the potentiality of annihilation, the dark background and shadow, which are constituents in potentiality for creative difference. Sponge-ability is an attribute requested from a subject in contemporary capitalism. Sponge is material, which absorbs, and since it is plastic it is also flexible and elastic. It will retract to its original form after use, thus it is elastic until it is thoroughly worn out and exhausted. Sponge is an ideal type or mode of subjectivity for capitalism. It is employable, which implicitly proposes infinite elasticity and flexibility(5)Employability is synonymous to flexibility, writes Malabou. (Malabou 2008, 46). The materiality of a plastic sponge as an ideal mode of a contemporary subjectivity implies inexorably other aspects of plasticity, as well. When my plastic soul loses its breath, would not a shadow of flexibility – detonative unpredictability – potentially become activated as part of my essence – as Semtex-subjectivity? In case of twenty years of economic transformations in Poland, which originally boosted myriads of small enterprises, but eventually evolved into bankrupts and large conglomerations in the end of the first decade of the new millennium, new attributes of subjectivity had to be obtained in order to survive. One of them is the dictum of employability – to become a sponge. The performance had to shift, again, and the plastic type was moulded anew. In the performance of “Life in Bytom” there are elements of such plurality of plasticity. I feel nervous and I have no specific skills to present, which the audience could marvel. I am as mouldable and resilient as those people are who were watching my performance in Bytom – the “Bytomians”. During the working process, when I discussed with three young men at their “club” in the basement of a blockhouse in the suburb of Karb in Bytom, or when I gave a diagram drawing workshop for the middle-aged women in the social centre of Bobrek, I felt resilience, moulding and drive for annihilation. In the performance I cannot present anything to admire or to get exited about, but I can pick up certain modes of this type of existence. There was a strong sense of resilience, which I encountered during the interviews and workshops. In the performance and video there were parts, which were scripted as a space for the resilience or explosive plasticity to be expressed. Abrupt movement could take place in some part of my body, which I would emphasize and follow for a moment. However, these movements did not develop into a full sequence, but created intentional ruptures, which in turn would lead into another path. Whatever the partially fabricated impulse might have been, it would lead into an area in which I did not have full competence, excellence or understanding. I did not feel like a master of the performance, but more like a sponge releasing matter from my pores. I felt like a plastic sponge, Mickey Mouse or SpongeBob struggling in the presence of a shadow and the loss of coherence or meaning. It might be good to perceive the performance as a folding and meandering riverbank. Yet, plastic sponges are not rhizomatic structures, but thoroughly synthetic. They may seem similar from their outlook, but it is necessary to recognize the difference between organic rhizomes and synthetic polymers. The performance is similar to behaviour, which is needed to fulfil the synthesized requirements of self-control in contemporary capitalism. We perform the polymeric structure, which may imitate the structure of a rhizome, but it is ontologically different. Movements that take place in my performance practice – the schizoanalytic practice – are not “natural” or “authentic”, but ridiculously fake and crude. Semtex is explosive used by terrorists. Thus, destructive plasticity as a concept may lead us to think about transformations as revolutionary action. It may lead us to consider a terrorist action as the “greatest work of Art” (Spinola 2001. ), a monster or “the mother of events” (Baudrillard 2001.) It is true, that rupture is implicit with plasticity, and Semtex is being used for transgressive purposes. But what I want to focus on here is that an ideal cognitive worker as a sponge has synthetic and not organic ontology. It is not a revolutionary subject, but plastic, imbued with the shadow of a mouldable plastic. The ontology of such a subject is flexible, adoptable and mouldable to a degree. We do not need to blow air in the sponge, as in Golem, since a sponge is a synthesized being and distinguished from the explosiveness of Semtex, the shadow of plastic. It is not the explosive event for the sake of rupture, but in the plastic manner of Semtex, that artistic practice aims to probe or investigate. To be partially a Hegelian spirit, but ontologically different and synthetic, as such. The test for contemporary subjectivity lies between the sponge and Semtex. The performance of a sponge is limited and in relation with the precarious working conditions. Capitalism has this function to organize these individuation processes and types or modes of subjectivity required. The performance of a subject is a more or less successful balance between rigid and supple flexibility. (6)As Gilles Deleuze has formed the paradigm shift from discipline to control (Deleuze 1992), Luc Boltanski and Eve Chiapello write in their book The New Spirit of Capitalism, that capitalism functions in “open spaces without borders, centres, or fixed points, where entities are constituted by the relations they enter into, and alter in line with the flows, transfers, exchanges, permutations, and displacements that are the relevant events in this space.” (Boltanski and Chiapello 2005, 92). Neoliberal capitalism is ontologically polymeric and synthetic. It has an essence, which expresses all three modulations of plasticity: reform, deform and rupture. In the precarious network, where artistic practices are indistinguishable from others, the flexible sponge subjectivity becomes a variable and relational node. In a network a sponge subjectivity is precariously unreliable, but flexible. However, when there is a scission, rupture or several of them in a coherent sequence, the sense of meaning is blurred. Blurring is one of the transformative and exhausting aspects of destructive plasticity, which produces transformation of subjectivity into something unknown, neutral, cool and indifferent. A nest of continuous events may affect subjectivity permanently. In the context of Bytom, such a nesting of events was clearly apparent. The past twenty years of transformation had had a full and overall impact on the environment and social attachments producing political cynicism and brutal economic decisions on a variety of scales. Still, I encountered contrary events taking place such as better reception and criticism of artistic practices such as mine, or better DIY self-organization and comprehension of the change of subjectivity. For me they are the partially formed matter of the dark background. Finally, my point in this paper is not to lift up some undercurrent or unforeseen meta-structure guiding socio-political or psychological performance, but to point out, that affective knowledge is a skill of the sponge subjectivity, indeed. It is an attribute, which the unemployed mother living in Bobrek or the administrator of a culture centre has obtained during the transformation period. Plasticity does not mean only malleable employability, but self-organization of the malleability, explosiveness and resilience. It was part of my project in Bytom to articulate this. Aleksandra Bubniak, Agata Cukierska, Adam Ćwieląg, Radosław Ćwieląg, Grazyna Daniel, Barbara Dzieran, Sandra Drzewiecka, Piotr Hajda, Łukasz Jastrubszak, Katarzyna Kalina, Leena Kela, Irena Król, Karolina Kucia, Natalia Kudlek, Sara Kudlek, Gosia Latusek, Janusz “Junior” Lipiec, Krzystof Lipiec, Maciej Mazak, Małgorzata Mazur, Marcin Mazurowski, Sławomir Nosal, Anna Papierzańska, Marek Pluciennik, Maria Pszbyłek, Stanisław Ruksza, Wiktoria Rys, Agnieszka Skowronek, Dawid Sarnacki, Kamila Stawińska, Aleksandra Stoklos, Łucja Supron-Kucia, Łukasz Szymczyk, Agata Tecl, Martyna Tecl-Reibl, Zuza Węsierska, Kacper Wiśniewski, Maja Wiśniewska, Brygida Wolny, Elżbieta Wójók, Irena Wyskiel, Piotr Wysocki, Krystyna Zelawska and Alicja Ziob. The project was supported by The Theatre Academy Helsinki, TAhTO research school in Helsinki, The Art Council of Finland, AVEK, Performance Matters in London, FRAME Fund Finland and CSW Kronika in Bytom. Tero Nauha is a performance and visual artist. He is a research student in the Artistic Research School in Helsinki, in the program of Performance Art and Theory. His research interests are subjectivity and performance in the context of cognitive capitalism. His research consists of schizoanalytic practice and three artistic works, two of which have already been presented: “Loop Variations” at the MUU gallery in Helsinki in 2008 and “Life in Bytom” at the CSW Kronika in Bytom, Poland in 2012. In 2010 he was a visiting research student at the department of Visual Cultures at the Goldsmiths College of London. 1) L’Avenir de Hegel, plasticité, temporalité, dialectique from 1996 was published 2005 in English, titled The Future of Hegel: Plasticity, Temporality and Dialectic. 2) O’Sullivan writes that “it is not the virtual that is here being colonized, but simply the possible, or we might say – at a stretch – a specific set of virtualities, or even certain actual-virtual circuit.” (O’Sullivan 2012, 239). 3) I want to thank professor Esa Kirkkopelto for insight on how mental processes are interpreted through the metabolic fluids and humors in antiquity and beyond. 4) I want to thank professor Kelina Gotman on the issue of shadow, mirror and echo. Her presentation on the philosophy of Clement Rosset at the “How Performance Thinks”-conference in London, April 2012 affected a great deal on my articulation of this subject. 6) As Gilles Deleuze has formed the paradigm shift from discipline to control (Deleuze 1992), Luc Boltanski and Eve Chiapello write in their book The New Spirit of Capitalism, that capitalism functions in “open spaces without borders, centres, or fixed points, where entities are constituted by the relations they enter into, and alter in line with the flows, transfers, exchanges, permutations, and displacements that are the relevant events in this space.” (Boltanski and Chiapello 2005, 92). Cyrulnik, Boris. 2005. The whispering of ghosts: trauma and resilience. (Translated by Susan Fairfield.) New York: Other Press. Hegel, G.W.F. 1977. Phenomenology of Spirit. (Translated by A. V. Miller.) Oxford: Oxford University Press. — 2012a. The New Wounded: From Neurosis to Brain Damage. (Translated by Steven Miller.) New York: Fordham University Press. — 2012b. Ontology of The Accident: An Essay on Destructive Plasticity. (Translated by Carolyn Shread.) Cambridge: Polity Press. Silverman, Hugh J. 2010. ”Malabou, Plasticity, and the Sculpturing of the Self”. Concentric: Literary and Cultural Studies. 36.2. September. pp. 89–102.